The Rinchen Terdzö (Tib. རིན་ཆེན་གཏེར་མཛོད་, Wyl. 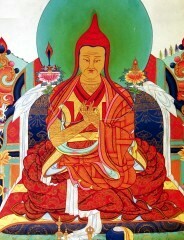 rin chen gter mdzod), the Treasury of Precious Termas, is one of The Five Great Treasures of Jamgön Kongtrul the Great. It is a compilation drawn from all the termas that had been discovered up to his time, including Chokgyur Lingpa's treasures. Fearing that these teachings would be lost, he started the work in 1855 with the blessing of Jamyang Khyentse Wangpo and it was completed in 1889. Simply to receive the oral transmission and empowerments of the Rinchen Terdzö takes from four to six months. རིན་ཆེན་གཏེར་མཛོད་ཆེན་མོ་, rin chen gter mdzod chen mo Shechen Edition, 2007-2008, 70 vol. Dilgo Khyentse Rinpoche published an edition in 111 volumes, which was based on the Tsurpu edition as supplemented with blockprints from Palpung and other great monasteries of Kham. It should be noted though, that actually the version published by Dilgo Khyentse Rinpoche contained many text that were not part of the Terdzö, and were merely included because at the time in exile there was a certain project which the Americans funded that paid for each volume, and so, the more volumes the better. Of the various editions, the Palpung edition has the greatest reputation for accuracy. Recently Shechen monastery has published a new version were the Tsurphu and Palpung editions have been combined and thoroughly spellchecked. The main editor was Dakpo Tulku Rinpoche. This new and complete version has been made available online by the Tsadra foundation. Schwieger, P. "Collecting and Arranging the gTer ma Tradition: Kong sprul’s Great Treasury of the Hidden Teachings" in Anne Chayet, Cristina Scherrer-Schaub, Françoise Robin & Jean-Luc Achard, eds., Edition, éditions: l’écrit au Tibet, évolution et devenir München: Indus Verlag, 2010. Tulku Thondup, Hidden Teachings of Tibet (Boston: Wisdom, reprint edition 1997), 'Appendix 5: Categories of Texts in The Precious Treasury of Termas'. Tibetische Handschriften und Blockdrucke. - Teil 15: Die mTshur-phu-Ausgabe der Sammlung Rin-chen gter-mdzod chen-mo nach dem Exemplar der Orientabteilung, Staatsbibliothek zu Berlin, Preussischer Kulturbesitz, Hs or 778 ; Gesamtindex / erstellt von Saadet Arslan. - Stuttgart : Franz Steiner Verlag, 2011. - XXV, 277 S.